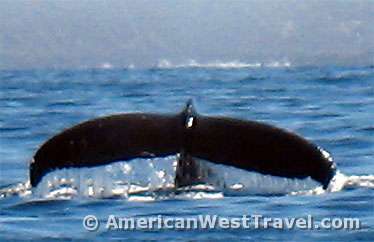 This past summer has been outstanding for whale watching on the Central Coast of California. 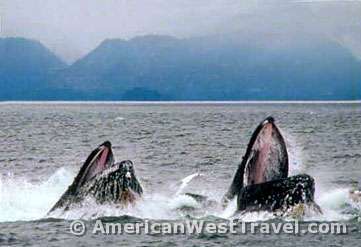 Humpback whales have been active and close to shore. A photo of a humpback popping its head out of the water in front of an astonished kayaker went viral on the Internet. The whales came alongside the Hanford Pier in Port San Luis enchanting hordes of tourists. The day we visited the Harford Pier, Port San Luis was packed with cars and visitors. However the whales were now about one hundred yards off the end of the pier. You could see the water spouts from the whales blow-holes as they surfaced to breathe, as well as a brief glimpse of the whale itself. Hundreds of birds circled overhead. The whales’ chumming of the water for fish apparently made easy pickings for the birds, too. Marine mammals resonate with humans, especially whales. Their high intelligence, immense size, and relative rarity make us want to see them. Perhaps the shame of hunting these innocuous creatures nearly to extinction, or disgust that needless hunting and harpooning still goes on, also affects us. The excitement of getting a glimpse of whales at Port San Luis, and the urge to get a closer look, prompted us to sign up for a whale watching cruise out of the nearby town of Morro Bay. Down at the dock, the staff of Sub Sea Tours assured us that there had lately been great sightings every day. 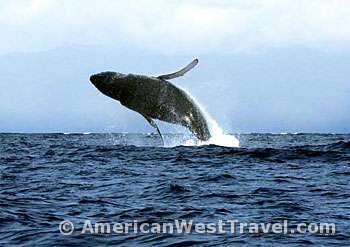 The primary attraction is the humpback whales which generally feed in the nutrient-rich waters of the California Central Coast from about May to October. The humpbacks which can be up to fifty feet in length and weigh up to forty tons are especially acrobatic and entertaining as they hunt for food. They frequently breach the surface, slap their fins, lunge out of the water, or flip their tails high in the air as they dive back down. Very lucky whale-watchers may see a humpback fully breach and go flying through the air, an extraordinary sight. We observed this several times but only in the distance. You could see the enormous splash when tons of whale went crashing back into the water. The pristine and nutrient-rich waters of Estero Bay also feature many other marine mammals and other species of whale. Real lucky visitors might spot an occasional blue whale, the largest creature that’s ever lived, larger than any dinosaur. We didn’t spot a blue but did see a little bit of everything else. Our cruise started at nine a.m. and offered a rare perfect morning, warm and no fog and little wind. Upon embarking, we immediately pass the floating dock covered by a group of snoozing, sunning sea lions. These guys used to sprawl all over the wharf near the fishing boats getting in everyone’s way until they got set up on this dock in the middle of the inner harbor. 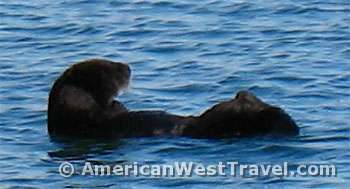 As we pass through the narrow channel next to Morro Rock leading to the open sea we observe about half a dozen sea otters floating lazily on their backs. Just outside the harbor a small school of dolphins passes by, frequently surfacing. It quickly becomes apparent that taking photos on this kind of a tour is not so easy: the marine mammals appear only for a few seconds at a time, the boat is constantly bobbing, and twenty tourists are constantly moving around trying to see the action. The captain is heading north following a report of whale sightings off the town of Cayucos. Soon, sharper eyes spot whale spouts several hundred yards ahead. Then there is a full breach. However at this distance all that can be seen is a huge splash. 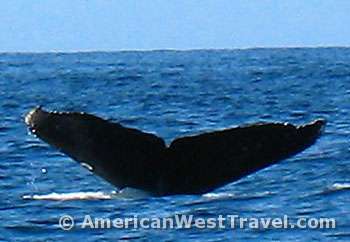 We get to within a hundred yards or less and can readily see the whales as they surface. No fancy breaches up close but a couple of good tail flips. These two humpbacks, a smaller one and a larger one, don’t seem to be feeding in one place but are on the move. They stay underwater for minutes at a time. When someone spots the next water spout we chase after it. 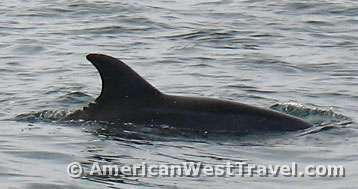 Along the way, the captain points out a bottlenose porpoise seemingly chasing along and then a minke whale which is smaller and somewhat dolphin-like. Our chase seems to be making a big circle back towards Morro Bay. As we are getting close to the end of the tour we finally hit pay dirt. There are whales spouting and surfacing all around. The two we were following seemingly have joined a bigger group. And then for the highlight of our tour, a whale surfaces right in front of the boat! While the head and tail were just below the surface, the whale’s enormous torso was fully above the water. I guessed the torso was about six feet wide and perhaps twenty-five feet long. After a few seconds the whale dove and flipped its giant tail right in front of us. As we headed back to port, the captain took a short detour to observe a sea lion “boil” (Photo, above). Dozens of sea lions form a large, loose circle and are in a feeding frenzy. They must have found a large school of fish. But it’s not long before the boil breaks up. It could be that a larger predator wants the same fish. Perhaps that’s why the whales were congregating in the area. 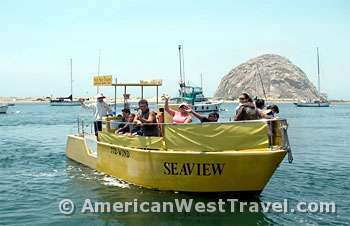 Soon we pass Morro Rock heading back into the harbor. It was a great cruise, and seeing the whale up close was a once in a lifetime thrill.